Valentine’s Day is in two days, and today, I’m scrambling to make something for Angell as a token of my love. As I’ve been doing this, I’ve been combing through old photographs, looking for specific images that will accomplish my purpose (I’m being vague because Angell will read this before the 14th). Looking through old photographs is to climb into a time machine. I’ve read where smells are the most evocative of the senses at triggering memories, and while I’ve found this to be true for myself, the combination of my eyes and old photos is mighty strong. 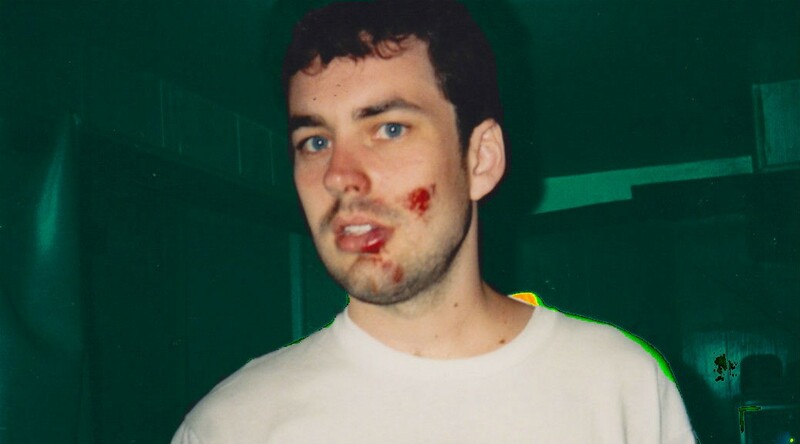 Take this photograph of me looking like I got jumped in an alley. This was taken in the summer of 1995, when Angell and I were living in New York. Her friend Rhonda had come to town to stay with us a few days, and we went to Central Park with her and my friend Suzy, who was in Elizabeth Dillon’s acting class with me. The previous Christmas, Angell’s mom got us each a pair of roller blades for Christmas. I have no idea why she bought us those things. We’d never expressed an interest in roller blading or any other activity that involved footwear designed to make one fly like the wind. Before Rhonda’s trip to New York, I’d used my roller blades exactly once. Angell and I took them over the Juniper Park, a few miles from our place in Queens. The park is a rectangle, 1.3 miles in circumference. I made it around once before giving up. I’d never ice skated, and couldn’t quite get the hang of it. Angell, on the other hand, picked up on it rather quickly. She was a skate rat in middle school, so maybe that had something to do with it. I don’t remember who suggested roller blading in Central Park. I wouldn’t be surprised if it was me. We had no blades for Rhonda, and she was very much okay with that. We drove into the city that day, and picked Suzy up at her apartment in Manhattan before heading over to the East Side to find a parking spot somewhere in the 60’s. We packed in our blades and put them on after we’d walked around a bit and gotten past the Alice in Wonderland statue by the Boat Pond. Rhonda followed on foot as we made our way toward the Bethesda Fountain. I remember Suzy being quite good on her blades. Angell was next on the depth chart, followed by wobbly me. When we passed the Band Shell and crossed the road just before the Bethesda Fountain, I looked to the right to see if we could avoid all those steps. I noticed a sidewalk snaking up into the trees and then down to the pond where you rent the row boats. I skated past the girls and told them to follow me. As I made my way up the little hill, Suzy said she didn’t know about that path. When I got to the top of the little rise, the sidewalk turned to the left before plunging down a short, steep hill that dead-ended at a sidewalk at the bottom. Just past that was water. For some reason, I felt no fear or caution, which is not like me. Instead, I paused a brief moment before pushing off just as Suzy and Angell were making the top of the hill. The impulse to skate down this hill was done without a thought to how I’d stop at the bottom. I could barely stand upright on the stupid roller blades, let alone stop on a dime at the bottom of a steep hill. As I gained speed, this thought raced through my mind as I comprehended the stupidity of my decision. My knees bent, I stared ahead of me at the T-shaped intersection at the bottom of the hill. I’m not a panicky person, and in a split second, I formulated a plan. I noticed that to the left of me, it seemed soft and spongy, with vines and other plants bordering the sidewalk. The plan was to simply skate off the sidewalk into the viney stuff and have a soft landing. The problem with that plan occurred when I took my eyes off that T intersection. Me being the novice blader, I was wobbly on my feet when I was barely moving. At this ever-increasing speed, I was a disaster waiting to happen, and when I shifted my gaze to my left, my feet flew out from under me. In the moment when I crashed, time slowed to a crawl. I saw my feet shoot up as though being jerked by a rope. As this happened, I threw my arms back reflexively to soften the blow of falling on asphalt. As I did this, my body somehow spun in the air, and as my left elbow hit first, splitting the end of my radius bone, my left cheek was next to hit, emitting a shower of starts, and drug behind me a bit before I rolled over and gave the right side of my face a go. As I spun around, my knees got all scraped up too. As I slid off into the dirt, time resumed its normal pace, and I began laughing and cursing as the girls made their way to me. Angell and Suzy, afraid of suffering the same fate as me, side-stepped their way to me as Rhonda was able to run. They tried to get me to take it easy as I sat up. At first, it didn’t hurt, but as the blood began to move into the banged-up areas, the stinging started. I assured them I was fine. They were all wincing at the look of my face, and none of them had mirrors, so I didn’t know how bad I looked. My elbow felt weird, but I figured it was just a bruise. 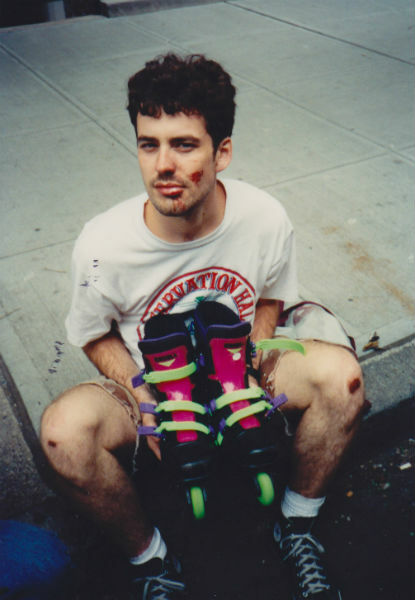 As I sat there, I pulled off those rollerblades for the last time and got back into my black high-top Chucks and got to my feet and told them it looked worse than I felt. Rhonda was wanting to rent a row boat, and me being me, that’s what we did. For the next 30 minutes, I rowed the three girls around the Central Park Lake in a rowboat with what turned out to be a slightly broken arm. At that point, the swelling hadn’t started, and I felt okay. The next day, my arm stiffened up and hurt like hell. The photo above was taken when we got back to the car. I love it. The Preservation Hall t-shirt was a memento from our honeymoon to New Orleans. The sand cammies are still in my wardrobe, and when I’m not fat, I wear them. The next day, I showed up for work looking like I’d been beaten up on the way in, and my boss sent me straight to St. Vincent’s, down in the Village, to get looked at. That’s where I learned that I’d broken my arm. A day or two later, we drove Rhonda to LaGuardia and put her on a plane home, and over time, the scrapes scabbed and healed, as did the arm. These days, the elbow aches when I do yard work or swing a hammer or use my heavy duty drill for any length of time – a little reminder of the time when I went rollerblading in Central Park. Whenever I visit New York and get a chance to walk through Central Park, I always head over to the Band Shell and the Bethesda Fountain and watch the street performers work their hustles. But what most attracts me are the skaters. I love the roller boogie skate dancers, with their smooth and rubbery moves that make skating look so easy, but what I really love are the young daredevils who usually congregate over at the steps that go from the road down to the fountain. They’ll take turns getting up speed at the top of the stairs by backing off from them and sprinting at them as hard as they can before leaping in the air just as they reach the top step. As they sail through the air, they’ll do a 180 and get into a crouch, looking behind them and anticipating their landing spot. The successful ones stick the landing and continue to click-click-click down the remaining steps at break-neck speed. If you can’t see them land, you know they made it by the oohs coming from their peers and spectators. The unsuccessful ones wipe out and go spiraling out of control down the remaining steps, cursing and yelling. Their failure is usually met with howls of laughter from those gathered, especially when the skater gets back up on his feet and shows that he’s okay. I admire the successes, but relate to the failures. I know just how those guys feel.